A misplaced workshop tool from the Hunter's Dream. kneading blood gems into them. Blood gems add properties to weapons when used tofortify them, as blood defines an organism. 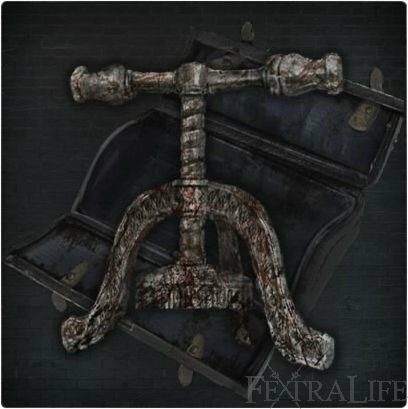 Blood Gem Workshop Tool is a Key Item in Bloodborne. Bring this item to the Workshop in Hunter's Dream and you will be able to upgrade your weapons with special properties. In a chest in Central Yharnam, immediately following the Father Gascoigne boss fight, located in the library area leading up to the Cathedral Ward lamp. If you missed this item, go to the cathedral ward lantern, and walk behind you and go down the spiral steps. So I&apos;ve had this tool for a while now and I didn&apos;t realize I could use it, but when I go to the Hunter&apos;s Dream it doesn&apos;t let me use it. I&apos;m very confused on why it won&apos;t let me use it even though I have it in my Inventory. Any Help?